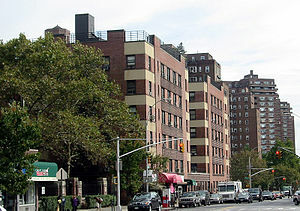 View of Grand Street showing 26 years of cooperative development: Amalgamated Dwellings (1930) in the foreground with two of the Hillman Housing buildings (1947-50) behind it. One of the East River Housing towers (1953-56) in the background. Cooperative Village is a community of housing cooperatives on the Lower East Side of Manhattan, New York City. The cooperatives are centered on Grand Street in an area south of the entrance ramp to the Williamsburg Bridge and west of FDR Drive. Combined, the four cooperatives have 4,500 apartments in twelve buildings. The cooperatives followed strict Rochdale Principles, with one vote per member, irrespective of the nominal value of his shares. Resale of shares was restricted; members moving out of the apartments had to sell their shares back to the cooperative at the buying price, minus a flip tax. After the original financing structures governing the apartments were phased out, beginning in 1986, the shareholders of each cooperative decided, in separate votes in 1997 and 2000, to abandon the limited equity rules and free the resale of shares, in some cases increasing the value of apartments fivefold. To keep the maintenance fees low for original tenants, many of them retirees, a high flip tax is charged, up to 17.5% of the gross sales price for "first sales" and up to 8.5% for "second sales". In a similar instance, the shareholders at the Penn South sister cooperative in the Chelsea section of Manhattan voted to continue operating under limited equity rules. 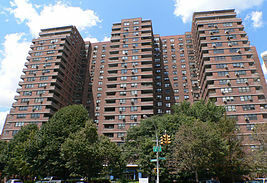 Seward Park Housing Corporation is located in the triangle between Grand Street and East Broadway, and abuts the New York City public park that shares its name. The buildings, designed by Herman Jessor, share the general design of the East River Houses, with four towers facing the Lower East Side. Each of the twelve semi-attached towers has seven or eight apartments on each floor around a central stairwell and corridor. Construction work was begun in 1957 and finished in 1959 at a total cost of $23,258,392.75. A mortgage loan from Bowery Savings Bank and pension funds of the United Hatters, Cap & Millinery Workers, International Union as well as Brotherhood of Painters, Decorators and Paperhangers of America covered $18 million, with about 25% of the costs paid as equity by the 1,728 cooperative members. In January 1999, in the wake of a collapse in the parking garage, New York City building inspectors suspected there could be a potential flaw in Jessor's "honeycomb" design of the massive garage roof. The roof had been built to support a vast playground/park above, with trees and grass upon hundreds of thousands of pounds of soil. After the collapse on Friday night, January 15, 1999, the New York City Department of Buildings opened an investigation into other Jessor projects to test for durability. The investigation did not turn up any major design flaws, and cited convergence of many elements including several days of warm rain, followed by quick freezing, thawing, and refreezing, along with a stoppage in the drainage system combined with minor cracking of the concrete in the roof and the immense weight above. After a four-year lawsuit, the Greater New York Insurance Company, insurer for Seward Park Housing, lost their nonpayment case to the cooperative, and $18 million for the damages. After the insurer won a subsequent appeal, the insurer and coop settled in 2010 with the coop returning $3.25 million to the insurer. ^ "Co-op Village Online Community". Retrieved 7 May 2016. ^ "Seward Park Co-op and Insurance Company Settle Garage Collapse Lawsuit | The Lo-Down : News from the Lower East Side". Thelodownny.com. 2010-05-06. Retrieved 2015-12-24. Wikimedia Commons has media related to Cooperative Village.